Beverly Hills, California – (December 5, 2015) – Julien’s Auctions, the auction house to the “Starrs”, closed the three day auction of The Collection of Ringo Starr & Barbara Bach by setting more world records. The Collection of Ringo Starr & Barbara Bach auction began on Thursday, December 3, 2015 and ended today, Saturday, December 5, 2015. The once-in-a-lifetime collection curated by Ringo & Barbara themselves included extraordinary memorabilia. The auction raised nearly $10 million. Among the seven of Starr’s personal drum kits in the auction was the iconic musician’s first 1963 Ludwig Oyster Black Pearl three-piece drum kit. 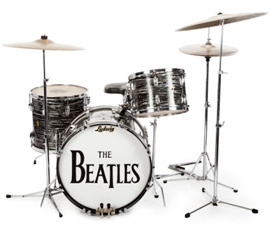 The kit was used by Starr in more than 200 performances between May of 1963 and February of 1964 and used to record some of The Beatles biggest hits including: “Can’t Buy Me Love,” “She Loves You,” “All My Loving,” “I Want to Hold Your Hand,” “Money,” “I Wanna Be Your Man,” and many others. Paul McCartney also used the Oyster Black Pearl kit on his first solo album, McCartney. This specific drum kit has not been seen in public for more than 50 years and sold for the record price of $2.2 million to Indianapolis Colts owner Jim Irsay. 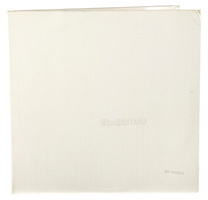 Breaking another record was the sale of Ringo Starr’s UK #1 White Album which sold for $790,000. The last record was set when an Elvis acetate sold for $310,000 at auction. Other highlights of the auction included the Ringo Starr Snare Drum from the #2 Ludwig Drum kit which sold for $75,000, the Ringo Starr Patek Philippe wristwatch which sold for $179,200, the Ringo Starr blue stone pinky ring which sold for $106,250, the black onyx pinky ring worn many times by Ringo Starr which sold for $100,000, the Ringo Starr “Hard Day’s Night” suit which sold for $50,000, the Ringo Starr RIAA White Matte Award signed by George Harrison which sold for $68,750, the George Harrison Gretsch Tennessean guitar which sold for $175,000. More highlights include a Ringo Starr Beatles Road Case sold for $40,625, the Ringo Starr “Hello Goodbye” used drums sold for $112,500, the John Lennon Sgt. Pepper Caravan Panel & Photograph sold for $125,000, a Ringo Starr Yellow Submarine premiere suit sold for $31,250, a Ringo Starr British Sales Award sold for $12,500, the John Lennon gifted Rickenbacker guitar which sold for $910,000, a Ringo Starr RIA White Matte Award sold for $11,875, a Ringo Starr Hofner bass sold for $22,500, a Ringo Starr “Hippie” Martin guitar sold for $17,500 and a Ringo Starr worn t-shirt sold for $15,000, among many other highlights. Portions of the auction proceeds of the Property from the Life and Careers of Ringo Starr and Barbara Bach will benefit The Lotus Foundation U.S., a charity founded by Starr and Bach. The Lotus Foundation is an organization which assists with a wide range of worthy causes around the world, focusing primarily on family and child welfare, women’s issues, addiction recovery and education. The Lotus Foundation is based in the United States and London (http://lotusfoundation.com/).